A week has passed since I watched "Cesare deve morire" and I am still trying to decipher the multiple layers on which this film has worked in my mind. The brothers Taviani have directed a masterpiece of 76' which however is so dense in content that the time is waxing inside one's own memory. 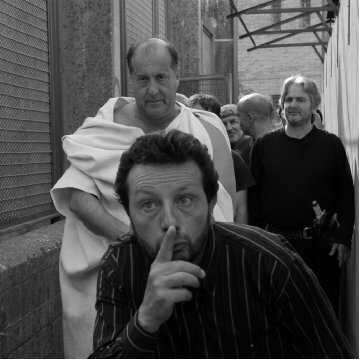 The Tavianis are documenting the mis-en-scene of a Shakespeare piece inside a prison. 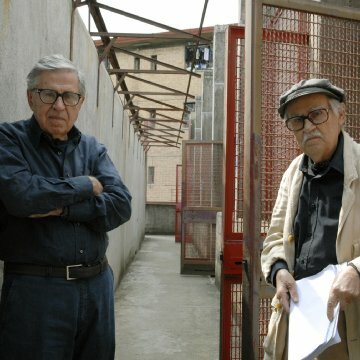 Probably the most impressive element of "Cesare deve morire" is the performances of the inmate actors. The fact that the film is shot as a documentary in its natural setting the film having two layers which are seamlessly weaved on each other. 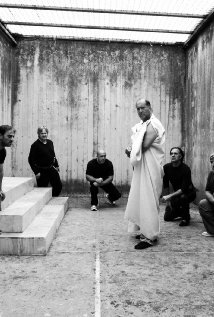 On the first level we see the prisoners who are passionately rehearsing the lines of their characters and on the second level we stand on front of Cesar, Brutus and Antonius discussing in the alleys of Rome. As in the case of Bergman, the brothers Taviani very successfully the relationship between theater and cinema . This setting is extremely symbolic and renders the actor performances utterly intense. It feels as if the prisoners, lacking their physical freedom, are getting deep into the skin of those new personas seeking the experiences which prison has deprived them of. The performances are so convincing that one has to contemplate on the nature of human destiny. Could it be that one's social condition or even coincidences could make the same persons capable of the best or the worst? Besides, the film leads to an unavoidable rumination of the concept of freedom in all its forms. A stark black and white photography pronounces the prison architecture and recreates ancient Rome in its bare corridors. The photography is perfectly self-standing and it would be of great artistic value even in the absence of plot. 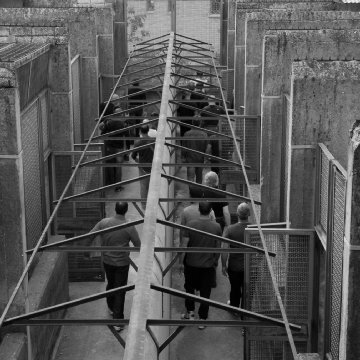 The black and white may emphasize the lack of freedom of the inmates but also allows the spectator to ignore redundant information and to concentrate on the performances of the actors. It is remarkable how architectural beauty arises even in a prison. The common spaces are illustrated exceptionally well and after a while one really feels lost in a limbo between the prison and Rome. Although the audience reaches catharsis after the end of Shakespeare's narration the narration of brothers Taviani remains unresolved into ones psyche. I personally believe that "Cesare deve morire" is one of those rare cinematic experiences that are capable to shake away well entrenched beliefs. That on its one would make it worth seeing but gladly this film is so much more.